HALLIE EPHRON: What's wrong with this picture? 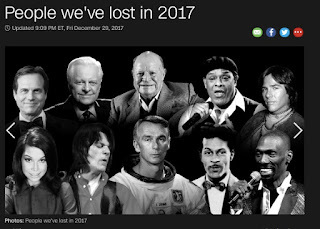 CNN published this image for their annual accounting of memorable people who died in the preceding year. Count the men. Now count the women. Back in 2012, I started counting the number of women (versus the number of men) who had obituary articles written about them in my local paper, the Boston Globe. The ratio was SIX to ONE: six times more dead men had lives deemed worthy of the obituary writer's time than women. The ratio was the same in the New York Times. It's a little better six years later. Today it's FIVE to ONE in the Times and FOUR to ONE in the Globe. However, in CNN's annual count of notable people we lost in 2017, out of 72 people remembered, only 7 were women. TEN to ONE. And what women did they include? Sue Grafton, Mary Tyler Moore, the woman who played one of the Von Trapp family sisters in Sound of Music, and the woman who played Joanie on TV in Happy Days. Finally, last week in an article entitled OVERLOOKED, the Times addressed the discrepancy. "Since 1851, The New York Times has published thousands of obituaries: of heads of state, opera singers, the inventor of Stove Top stuffing and the namer of the Slinky. The vast majority chronicled the lives of men, mostly white ones; even in the last two years, just over one in five of our subjects were female." With OVERLOOKED the Times identified fifteen women who were overlooked, and posted a form for readers to nominate candidates for future "overlooked" obits. The obituaries, written belatedly, attest to truly remarkable lives. You'll have to read the article to see their justification for the imbalance, which to me seems a bit lame. Because the bottom line is women have ALWAYS contributed. Major league. It's the recognition that's lagging. So what's your take on this? Is anything changing? JULIA SPENCER-FLEMING: I hope so. I subscribe to the NYTimes, and read the article - which is terrific - and the most jarring thing for me personally was that I had never realized the gross imbalance between the number of men selected for recognition and the number of women. And I think of myself as a very aware feminist! To me, that's part of the objective - we have to go looking for the women who made a difference. One of the things I love about Google's doodles? The way it's made me aware of scientists, artists and others who have contributed to history who were women and people of color. RHYS BOWEN: Women have been systematically excluded from the history books (unless they ended up burned at the stake like Joan of Arc). We know their scientific discoveries have been attributed to men. I've always been bemused by the fact that many people, men and women see a woman writer as pursuing her little hobby, men as establishing a serious career. On a plane recently I told the woman beside me that I still wrote two books a year. She patted my hand. "That's nice, isn't it," she said. "Hey," I thought, "If I were a brain surgeon and told her I did two brain surgeries a week would she say 'keeps you busy'? I keep hoping that perceptions are changing, but not sure they are. HANK PHILLIPPI RYAN: Well, I thought the section was beautiful. Yes, it's a long time coming, but gotta count blessings, give credit for awareness and taking responsibility, and then press on. Know what I'd like to know, though? Exactly who, in the past, CHOSE who was going to get an obit. Think it was a woman? I'm betting no. LUCY BURDETTE: Of course it wasn't a woman choosing Hank! Although, now that you mention it, obituary writer sounds like the kind of job they'd give a woman. Rather than first page news reporter, right? INGRID THOFT: Women have always done amazing things, but in American society, it’s only during the last 60 or so years that women have been claiming their place in the public sphere. The lack of representation is an issue of acknowledgment, but also opportunity. There are fewer women than men in most fields, and we need to get those numbers closer to 50/50. This also raises the issue of what accomplishments are worthy of an obituary. What about the mothers and fathers of all those accomplished men? They should get some credit! JENN McKINLAY: I believe it's changing. I look at the girls who go to school with the Hooligans and, yeah, good luck not giving these girls their due.They are smart, they are fierce, and they are not going to stand in anyone's shade. I love these girls! It's unfortunate that it's taken this long for women to be recognized as worthy contributors to society, but when you realize women couldn't get a credit card in their own name until 1974 or fight in combat until 2013, it's easy to see that the battle for equality is far from over but I believe we're gaining ground every single day. I was impressed that the Times put forth OVERLOOKED and I look forward to reading about more women of note through the ages. DEBORAH CROMBIE: I read the piece in the Times--it was fascinating. And, as I've never been in the habit of reading the obits, horrifying to realize that women have been so marginalized even in death. Now, I'll be noticing, not only in the national papers and news but in my local paper, and we can only hope that awareness spreads. Still, I just checked the Friday obits in the Times--five men. Don't you bet that we lost an interesting and accomplished woman last week, too? HALLIE: Did you read the piece in the Times? Are things changing in terms of women being recognized for their contributions? I did read the “Overlooked” piece and, even as I applaud this more-than-worthwhile effort, I’m saddened to realize that the recognition for women is still so slow to come . . . Nevertheless, this recognition of women’s contributions, even so belatedly, is a positive step in the right direction . . . . I agree. And it's not just the recognition, it's the opportunity... especially for older women. Women 'disappear' long before they actually die. Wow. "Women 'disappear' long before they actually die." There's the premise for a mystery novel in there, somewhere, Hallie! Overlooked was a great piece. I have always been an obit reader - ever since an assignment in seventh grade English class to write our own which included a trip to the NY Times where we learned that if you were famous, you most likely had your obit pre-written! The boys found that very appealing. And also where in the paper did the obituary run was a measure of HOW famous. In the obituaries section? On the inside from page? On the front page... above or below the fold? Yes, indeed - and some, writers especially wrote their own. Twain was one I think. That's one way to get it right! I have not read the "Overlooked" piece, but it doesn't surprise me. My personal score-keeping on the equality front focuses on movies and, to some extent, books. The Bechdel Test asks whether at least two named female characters in a work of fiction talk to each other about something other than a man. Think about your actual life for a moment, and then think about that test the next time you read or watch something. It's amazing how many books and movies don't measure up. When you add in a requirement that people represent all age groups . . . Yeah. Older women rock, but we are all but invisible in the world of film. I think we've overlooked a LOT. I have always admired the way British actresses are allowed to age naturally and continue to get roles. There is so much stuff that happens in our world because an older woman gets after it and gets it done, even though she gets no credit. I have a friend in her 60s, widowed, who is deeply involved with voter registration here in Texas. If there is a blue wave, come November, spare a moment to think about Shelley Pace and all the women like her, all over this country, who are working hard to make changes. Hallie, I remember when you were reporting on the imbalance in the Globe, and since then I've been noticing, too. Just yesterday my wonderful future daughter-in-law mentioned the Bechdel Test, Gigi - she's teaching a high school women's studies class. I also think we can be optimistic about young people changing the world. That's great, Edith. The fact that there is a high school women's studies class at all says the times are changing. I'm so happy to see the younger generation get politically vocal and active. I agree. Women, especially middle-aged or older, are virtually invisible. Jen, I know what you mean about the girls of today, having one of my own. Interestingly enough, when College time rolls around, your boys will have an advantage over those girls. There are more young women than young men applying to University these days, which means -- you guessed it -- that with two equally qualified applicants, the boy's gets a little extra weight. so interesting, Julia -- so why is it that more young women are applying than young men, I wonder. Well, that’s frustrating - even as a mom who’d like to see her sons accepted. I wonder why more women are applying? Are men dropping out or are more women empowered to go for it? Hmm. "Overlooked" was a brilliant piece of journalism, and it surprised me not at all. As long as those old white men can hold on to their misplaced sense of place, this won't change. Of all the obituaries I read in the article, and I read every one, the most impressive to me was the one of Henrietta Lacks. If you haven't read the book, you should. Because of this poor black woman, granddaughter of slaves, who was born and who died in grinding poverty, many of us are alive today. Not the least of the contribution of her immortal cells is the polio vaccine. I won't even get into the notion of the millions and millions of dollars of profit from these cells, none of which benefitted her family. Getting off soap box. Too early in the morning for me. Echoing Ann's call to read The Immortal Life of Henrietta Lacks. It's fascinating. I nominated the book for my book club read.....resulted in one long amazing discussion. Such an important book on so many levels. As y'all have said, who was in charge of deciding about obits? Haven't read the piece in the NYT, but not a surprise. And while some young women are fierce, there are still WAY too many who insist they aren't feminists, like it's a dirty word--even as they enjoy the opportunities fought for BY feminists. And I'll stand on my soapbox another minute--I can never understand the women who are in positions of power--senators, reps, gov'nors--who do their best to beat us all back to some vision of a perfect 'white' 1950s version of womanhood. Why aren't those women, who are telling us all what to do and trying their damnedest to legislate away our rights, why the hell don't they get back in the kitchen scrubbing those pots and birthing those babies with their mouths shut???! End of morning rant. Y'll have a GREAT day! Flora, I'm happy to rant right along with you! I've rarely been one to read the obituaries, or the "Irish funnies" as my uncle called them. When I was growing up, I'd look occasionally, but they were very formulaic and more focused on listing the deceased person's descendants than on telling anything interesting about the person who died. I don't remember noticing the male/female imbalance, but I was conscious that there were very few obits of black people. And this was Washington, DC, so there were plenty of black people dying. Jenn, your description could apply to my own three daughters, about whom I used to say would never need assertiveness training! They are all take-charge, intelligent women. When I filed for divorce in early 1974, it was still illegal for a single woman to hold a credit card in her own name. My attorney told me to leave his office and go directly to the local department store to apply for a card in my name, while I was still married. Thank goodness for his advice, because I would otherwise not have been able to establish credit at all, and would not have been able to put utilities and phone in my name, either. When the American Girl dolls came out they generated a ton of excitement with little girls--and their mothers, like me. It wasn't just that they were adorable, and had charming accessories, but the dolls came with five books apiece, each dealing with how a young girl of a certain time period would have fit into the history of that time. Kirsten was from a Midwestern pioneer family with Swedish roots; Samantha lived in New York City in the Victorian era; Molly was growing up during the aftermath to WWII; Addie's family had been slaves in the South. I myself nearly cried reading these books to my daughters, because it occurred to me why I'd never really gotten excited about history: I'd never been able to see MYSELF in any of the scenarios we studied. Historically, women have had great influence and power, all the way back to when primitive peoples did not understand how women could create and produce life. Is it any wonder that men have spent all of human history trying to keep us in "our place"? Exactly. When women are given the identical opportunities, we tend to excel. Which is probably why we've had to work so hard for that equality. I just interviewed Kate Moore, who wrote the nonfiction book the Radium Girks. That was an obituary in itself, in honor, essentially, of those young women who painted the radium dials on watches. We think we know the story, but we don’t, and the book is highly highly recommend it. I have been fascinated, recently, too, to read the obituaries of the young women who worked in intelligence in world war two. We had no idea, right? How many of them there must have been? And how brave they were, no matter what side they were on. And as I said, I loved the times section, but perhaps there would be improvement if “they”—and not just the Times—, did more stories about women >before< they died. Hank, the Dallas Morning News did a feature piece a couple of days ago on Melinda Gates. I had no idea even that she was from Dallas, that she was valedictorian of her Catholic high school and voted most likely to succeed, that she chose a university that had the best computer science program that included women, or how successful she was at Microsoft. Or that her lifelong commitment to service goes back to her high school and her upbringing in Dallas. These are the stories I want to read while women are alive! You know I meant Radium Girls. Yeesh. Hank, I so want to read Radium Girls! I got to edit the audio version of Radium Girls and I was just horrified by what happened to those young women. It's bad to cry at work. . . One point that struck me was that there was very little attention paid to the dangers of radium, so long as it was young women working with it. Until some famous sports(?) figure developed radium poisoning from a patent medication he used. As I recall, the book mentions a newspaper article with a headline something like this: "The Tonic Worked Great Until His Jaw Bone Fell Out" Truly awful. But the book was great. Yes, Deb, Melinda Gates was a woman of substance before she married, and I read or heard her intellect and self-confidence were among the character traits that attracted her husband. I never appreciated American Girl dolls in that way. And Barbies! Don't get me started. My kids are still pissed at me because I wouldn't buy them. In retrospect, that was dumb. It would have taken more than a Barbie to make either of my kids take a backseat. I wasn’t allowed to have Barbie either, but I didn’t want one so not a big deal. I loved my Bionic Woman action figure (she kicked my brother’s GI Joe toy around like no one’s business)! Hallie, I loved the American Girl dolls and books--probably more than my daughter. (I still have her Samantha in a box somewhere...) It was the telling of ordinary girls' lives that fascinated me. My daughters had Barbies, gobs of them. How could you keep their friends from giving them for birthday gifts? My dolls (including Barbies) did wild and unusual things. Nuff said. Parenting four girls and teaching Middle School gave me such an education! I too banned Barbies, but my kids bought them at yard sales and did all sorts of creative activities with them. Valerie Tripp, who wrote the first American Girl doll books, came to my 5th grade classroom to talk about the research. I only ever heard of Women's History as a parent/teacher! I had always hated history -- the battles and the kings and the presidents. Grr. But having my students enter (and win) the Seneca Falls Women's Hall of Fame essay contest was a whole different story. (2) Until you can answer the questions, WHERE DID WE COME FROM, WHY ARE WE HERE, AND WHAT HAPPENS WHEN WE DIE, you cannot belittle anyone else's answers. Denise Ann, those are GREAT questions. I love those questions, Denise Ann! I read that section of the Times and loved it. Makes an important and way overdue point.As did the movie Hidden Figures. Women who make a career of keeping other women down? Not a new story though still impossible to understand. Look up a woman named Phyllis Schlafly- I am old enough to remember her, the definition of hypocrite. Ah, Barbies. One of my daughters wrote a college paper about how much she gained in imagination and social skills in the long, complex Barbie games she played with her friends. (Certainly surprised me!) And guess what? She's got terrific group skills, a Masters in public management and works in development for a major non-profit. Which only shows me parents don't know everything. Triss, that is hysterical! Now I'm wondering if my daughter learned some of her group and management skills from the long, complicated games she played with her My Little Ponies... She acquired a Barbie somewhere, probably a hand-me-down from a friend, but never had much interest in her. My daughter and her friends, twins Kate and Laura, used to play Headless Barbie's Clothing Store. In part because at some point all they had were doll parts. Rhys, I can't stop thinking about all of the things you might have said to that woman. (My vacuum flew as I imagined your words and her expression.) But then I realized you must have met on of the dreaded (and very few, I hope) non-readers! My parents raised strong, assertive girls, and there were no bans on Barbies. I remember loving my Barbie vacation house that had a backdrop if you wanted to be at the beach or another if you wanted to be on the slopes. One of my Barbies had a scalp that rotated so she could be blond or brunette. Barbie had a plethora of choices available to her in my world. And beyond men and women, how about black and brown people (and other races and ethnicities) of both genders (Jim you mentioned this above.) That's a whole other "what's wrong with this picture?" question! When I was young, our public library had a series of biographies written for kids. I don't know if the series had a name -- all I remember is that the subjects were from American history and the books were hardcover, all orange. Anyway, there were about two full shelves of them and were almost all about men. I sought out and read every one about a woman but it didn't take too long. Even then, it didn't seem right. I looked at the titles in the "Who Was/Is" series that is currently written for that age group and only about 1/4 are about women. We are taught early that men are more important. The orange biographies were my favorites! And I do have to say that all I ever learned about women in history was from those books! Arghhhh! I lost my post when I was almost finished. I hate when that happens. To summarize. I haven't read the Overlooked article, but it seems a step in the right direction. Of course, not overlooking them in the first place would be the best approach. I am much encouraged by the girls and young women of today who appear to be much more confident and determined to pursue whatever their interests may be. My eight-year-old granddaughter is a prime example of this. She embraces the world with her enthusiasm for learning and taking on new activities. This coming weekend she goes to state in chess competition. And, I do my bit by buying her books like Women in Science: 50 Fearless Pioneers Who Changed the World. Chrystal Bridges museum in Arkansas has made a point of collecting art depicting strong women and, more recently, work by noted women artists. Hurray for the Agatha Best First Nominees! Is Winning The Only Thing? Please DO NOT Try to Fool Me! Risk Taking: But What About My Feelings? Seven Sinister Sisters Talking Titles! "From the Comfort of My Couch"